Happy Birthday to my dear Sc.Lady Mary's Silver Wellin Spirit. Leap year cat and 12 years old today. From Ch,Sargenta Silver Jewel and Sc.Lady Mary's Silver Linnea. Still going strong at the show bench and for breeding. 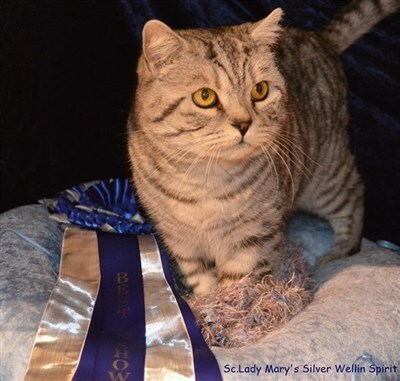 Proudly from cats of the year list 2015 he became Best British Shorthair stud and Nominated for Best in show 3 times. He is indeed a Spirit, keeping a lovely young condition in body and soul. Sending greetings to all his childrens, gr.childrens............. other family and their owners. You are all a part of it!